Food can convey so much of how we feel to people. What kinds of food make you think of love? Traditionally, things such as chocolate truffles, a fine wine, or a fancily plated expensive meal are the usual suspects put forth as the ways to show that we care. Happily, I live with someone who believes that love is home made and not store bought. In appreciation of this sentiment, I cooked him up a large batch of one of his favorite foods: chili. This may seem like a strange choice for a romantic dinner, but what can I say? Nothing from the kitchen says “love” to my sweetie like a big ol’ serving of comfort food. With the little bit of cocoa that I snuck in as a nod to romance, I think this is a perfect dish to make for your sweetie for Valentine’s Day. 1. Heat olive oil in large pot over medium heat, add the onion and sauté for 8 minutes. Add garlic, cook for 30 seconds. Add the peppers and carrots and sauté for 5 minutes, then add the spices and cook for 1-2 minutes, until fragrant. 2. Add the tomatoes and their juice, the beans, the broth, the cocoa, and the tomato paste, stir well. Increase heat to bring to boil, then lower heat, cover, and simmer for 30 minutes, stirring every so often. 3. Add the corn and simmer, covered, for an additional five minutes. 4. Remove chili from heat. Allow it to sit for 10-20 minutes to thicken up a bit more. While it is sitting, chop the avocado and cilantro. 5. 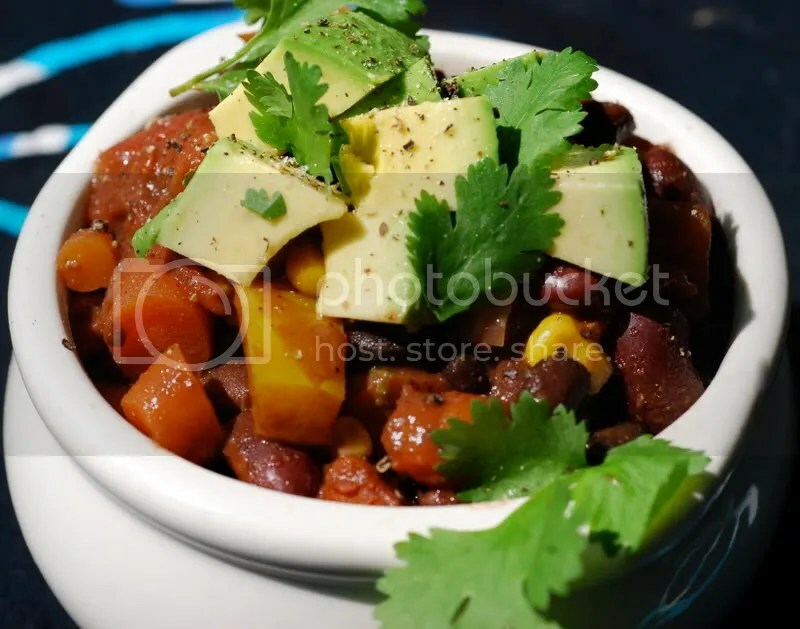 To serve: top each bowl of chili with a splash of lime juice, and few dashes of chipotle hot sauce, a generous heaping of avocado, salt and pepper to taste, and garnish with the fresh cilantro. You can serve this as is, or you can add a carbohydrate and serve over a baked potato, mashed potatoes, or, as I did, serve it over brown rice. She will be posting a round up of all of the recipes for 24 hours of voting on Monday, February 10th. You should head over there and check them all out – and if you find one that looks delicious (*ahem*) you should cast your vote! Excellent, Gail! I’m glad you went with the suggestion. Way to exceed my expectations — and way to combine two things I love (chili and chocolate) into one beautiful creation. I can’t wait to try it out. I’ll drop by the Fat Free Vegan Kitchen tomorrow to cast my vote. I love cocoa powder in chili, but the avocado really pushes this into the romantic category for me. I’m getting hungry just looking at it! Thanks so much for entering it into the contest! I love chili and I love avocados. With a little chipotle hot sauce added this was the best chili I have ever eaten. Awesome! Emily – I hope that you do make the chili and that it turns out great! Be sure to let me know. 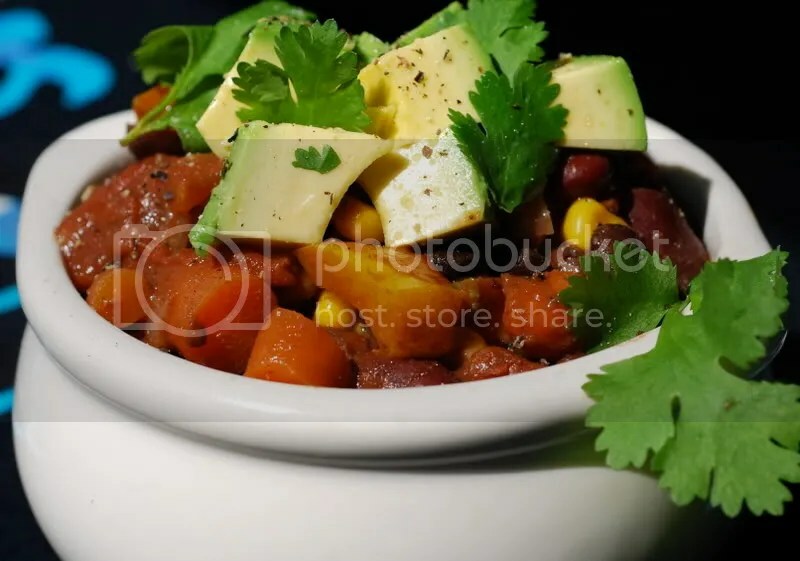 Susan – Your contest brought out a lot of incredible dishes from some creative bloggers. Thank you for bringing us all together! Dan – Go get yourself another bowl! 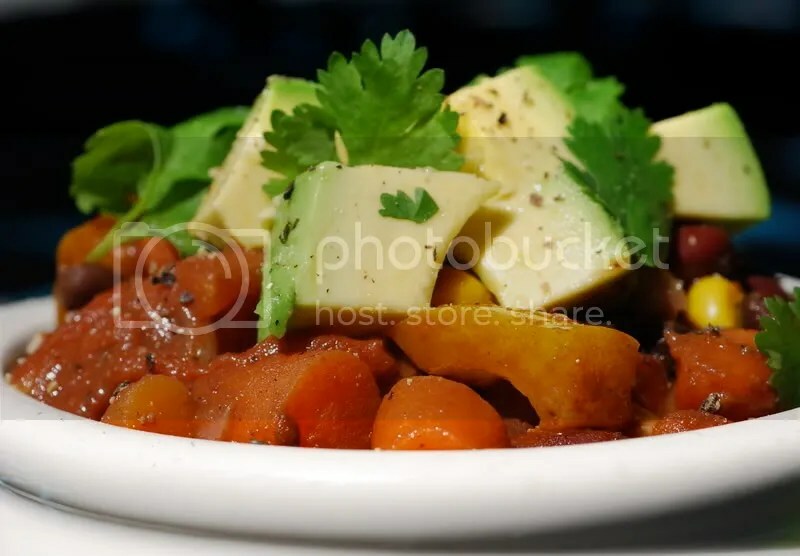 I have been dying to make veg chili & this looks very vibrant! I usually think chilis are made to look too boring, you did a good job of dressing it up. Made this last night, ti was delish! Thanks for posting this, I found it via Fat Free Vegan Kitchen. Katherine – Thank you for the feedback – I’m glad that you enjoyed the recipe! I am making this chili for the second time today! Today is Neviyahs third birthday party, and now we have made an annual chili and snow party at our home in the mountains… I can definitely feel the love in this chili!